Visitors frequently have questions about the ground transportation available to and from our terminals. At Maverick Helicopters®, we pride ourselves in providing VIP treatment to every guest from start to finish, so all of our helicopter tours include this complimentary service. 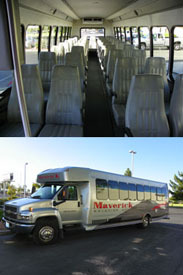 Maverick Helicopters has three types of buses—which seat 24, 32 and 35 passengers. They are silver and clearly marked with our red and black Maverick Aviation Group logo. 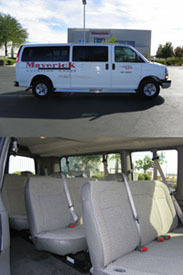 We also have several white vans displaying the Maverick Aviation Group logo that can seat up to 12 passengers. All of our vehicles feature comfortable seating and are equipped with air conditioning, as well as a radio for your listening pleasure. After departing your hotel, the driver may make other stops—along or near the world-famous Strip—to pick up additional passengers. Thus, your adventure with us actually begins when a bus arrives to carry you to our main terminal on Las Vegas Boulevard (across from the Welcome to Fabulous Las Vegas sign!) or to our terminal at the Henderson Executive Airport. Once you arrive at Maverick Helicopters’ terminal, you will be greeted warmly by our staff and checked in. Soon you will be on your way to enjoying your scenic helicopter tour!